Processing: Use the super critical CO2 technology to refine the paprika oleoresin, the quality increased greatly. 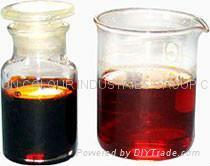 Description: It is a kind of dark-red colorful oil liquid, a fine food color with good mobility. It is light-resistant,hot-resistant,acid-resistant,alkali-resistant. It is soluble in oil and ethanol. It has the features of high purity, low dissoluble leftover, low metal ion, less impurity. The usage value has been increased greatly. Using model: It is widely used for the color of instant noodles, aquatic products, meat, cake,salad and cosmetics etc.